SHE’S been a proud member at Pitlochry Golf Club for 50 years. And now Margaret Chalmers has gifted a salver to celebrate her half-century with the Highland Perthshire club. It will be competed for by lady members off scratch in the over 50 age group. Keen golfer Margaret (85), who has also celebrated 75 years membership at Downfield GC in Dundee, is a past winner of the Atholl Cup for the Ladies Highland Open Scratch Championship, which she captured 12 months before joining Pitlochry. “When I was younger there were very few ladies scratch competitions. “I decided to give the trophy to the club for senior scratch golfers to play for,” explained Margaret, whose family is steeped in golf. Margaret, who is a seven times Downfield club champion and honorary member and past captain and president of Angus County, played off six in her heyday and won the North of Scotland Veterans championship at Alyth in 1996. “I joined Pitlochry a year after winning the Highland Open in 1967. The members have always been so kind and friendly. The ladies section is super. It has a very good social side. Pitlochry Ladies captain Louise Kelly welcomed Margaret’s gift. “Margaret is a lovely lady and it is a real honour to have someone like her as part of the club. “She has been such a good golfer in her time, and is one of our longest serving and most popular members,” said Louise. 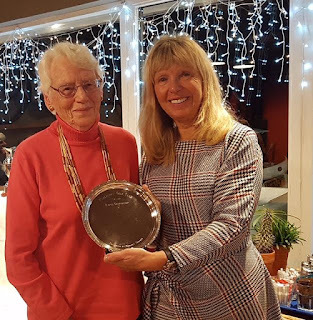 PItlochry ladies captain Louise Kelly receives a silver salver from Margaret Chalmers to celebrate 50 years as a member of the Highland Perthshire club.